M2L Color Change automatically changes the color according to the music. This effect analyzes the key of the music and shows different colors for different keys in the music [i.e., the mood]. ▪ Base Color - Defines the background color of the effect. If no audio input or music is available, this color is shown. The default color is Black. ▪ Fade - Defines how fast MADRIX changes colors [in %]. The higher the value, the slower MADRIX fades from one color to the next color. The default value is 20. Valid values range from 1 to 100. 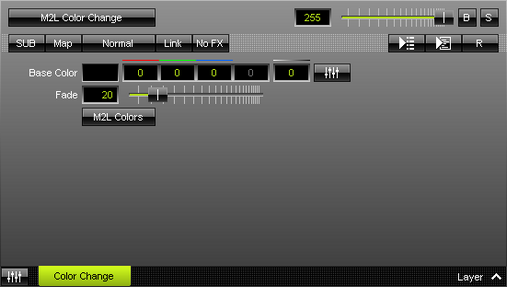 ▪ M2L Colors - Opens the M2L Color Table to specify which color is shown for which key.